Digitization help student to explore and study their academic courses online, as this gives them flexibility and scheduling their learning at their convenience. Kidsfront has prepared unique course material of Reasoning Coding and Decoding for UIIC ASSISTANT RECRUITMENT student. This free online Reasoning study material for UIIC ASSISTANT RECRUITMENT will help students in learning and doing practice on Coding and Decoding topic of UIIC ASSISTANT RECRUITMENT Reasoning. The study material on Coding and Decoding, help UIIC ASSISTANT RECRUITMENT Reasoning students to learn every aspect of Coding and Decoding and prepare themselves for exams by doing online test exercise for Coding and Decoding, as their study progresses in class. Kidsfront provide unique pattern of learning Reasoning with free online comprehensive study material and loads of UIIC ASSISTANT RECRUITMENT Reasoning Coding and Decoding exercise prepared by the highly professionals team. Students can understand Coding and Decoding concept easily and consolidate their learning by doing practice test on Coding and Decoding regularly till they excel in Reasoning Coding and Decoding. From the given alternative words, select the word which cannot be formed using the letters of the given word REFORMATION. Solution Is : REFRACT` word cannot be formed by using the given word`REFORMATION` because`C` letter is not present in the given word. If in a certain language, PLAYER is coded as QNDCJX, then how SINGER will be coded in the same language ? Arrange the following words as per order in the dictionary. Solution Is : Words dictionary order as follows Nobble→ Nobilitary→ Nobility→ Noble→ Noblesse. 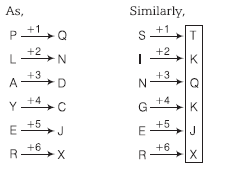 A series is given with two term missing. Choose the correct alternative to complete the series. If ALPHA = 36, BETA = 26, then DELTA = ? In a certain code language. North = West, South = East, East = North, which direction does the sun rise? Solution Is : In a certain code language. North = West, South = East, East = North Generally son rises in the east . In this code east is called North . Hence answer is North . 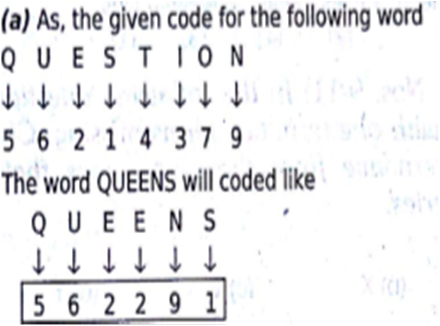 If QUESTION is coded as 56214379 then how can you code QUEENS?